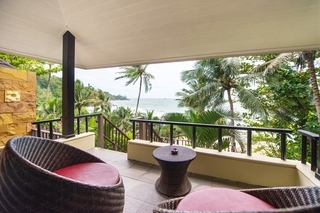 This upscale resort enjoys a highly privileged position on Thailand's famous Phuket Island near Nai Thon Beach, away from the noise and crowds of the bustling city. Here guests can lounge by one of the five sparkling outdoor pools, take a yoga course at the fitness centre, or indulge in a massage at the exquisite spa.Rooms offer sophisticated and contemporary décor as well as amenities such as SMART LCD televisions, Wi-Fi, and luxurious en suite bathrooms with rain showers. Guests can enjoy the resort's extensive selection of dinning and leisure facilities, including 24-hour room service, a trendy restaurant serving international cuisine, three lounge bars and two poolside bars, and a conference centre with six versatile meeting spaces. This resort brings a cosmopolitan sensibility to a seaside setting, allowing guests to experience comfort and luxury on a delightful holiday or business trip. The luxurious Andaman White Beach Resort basks in its idyllic sitting on a secluded stretch of pristine beachfront on Nai Thorn Beach. 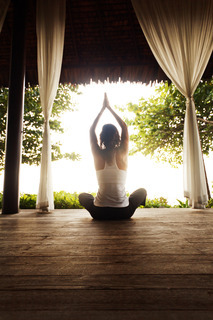 Tucked away amidst a plantation of swaying coconut palms it enjoys complete seclusion. The vibrant Phuket town is a 40 minute drive away and Phuket International Airport is just 8 kms from the resort.This charming resort exudes an air of romance and relaxation and hides behind a fringe of palms and lush vegetation offering a beautiful, remote getaway. 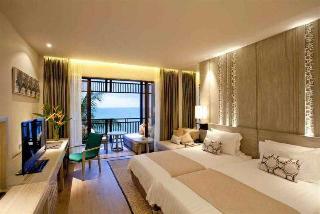 The elegantly-presented guest rooms feature private terraces and overlook the magnificent Andaman Sea. The guest rooms have been designed with guests' comfort and convenience in mind. The resort offers a wealth of exemplary leisure, recreational and dining amenities and services to ensure that each individual need is taken care of.